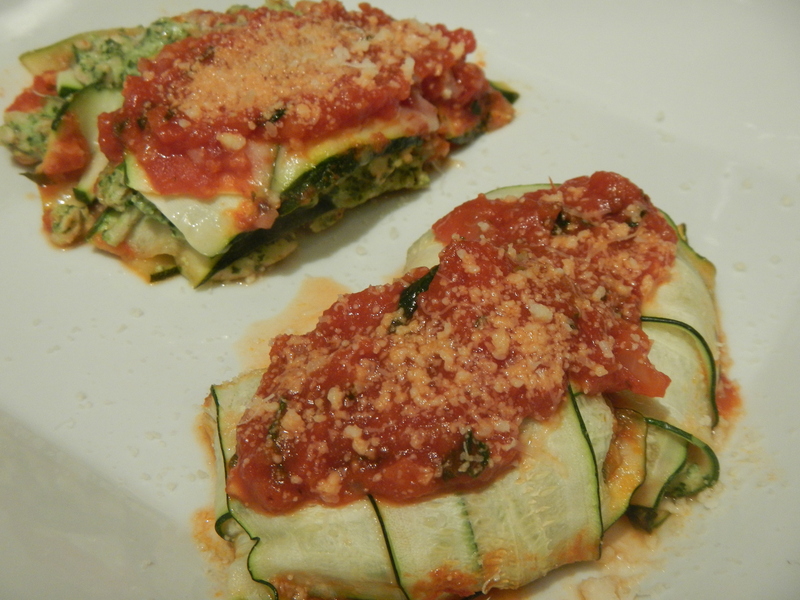 Zucchini “Ravioli” or “Lasagna” With Turkey and Kale Filling | This Girl’s Gotta Eat! The idea of using veggies as an understudy for pasta ravioli or lasagna is brilliant. I’ve seen pics for this all over pinterest, but the blog I finally stumbled on to check out the how-to for the ravioli, was CupcakesOMG!. Her how-to pics using squash are fab, so much so, that I’m not going to recreate them, I’ll just link you to them here. I used zucchini instead of squash, and went rogue on the filling and the sauce, but don’t feel confined to either of our recipes – use whatever filling and sauce you’d like. Once you get the ravioli or lasagna technique down, the variations are endless! I set out to make the ravioli tonight, however I underestimated how long it would take. It’s not hard, it’s just a little time-consuming. So after making a few of the ravioli, I switched my game plan and built a zucchini lasagna out of the remaining ingredients and baked them both together. Below I show both options…both are equally delicious! Cut ends of the zucchini off and slice down the middle so you have two halves. Using the narrowest setting on your mandolin, slice the zucchini into long, flat strips. In a large skillet, heat 1 Tbsp oil over medium heat. Add half the diced onion and saute for about 5 minutes, until softened. Add half the minced garlic and saute until fragrant. Season lightly with salt to taste. Add ground turkey and raise the heat to medium-high. Saute, until meat is cooked all the way through, about 5 minutes. I used a little homemade sausage seasoning to add some extra flavor to the meat. You can skip this step, but here’s the recipe for the seasoning I use: https://thisgirlsgottaeat.wordpress.com/2014/02/05/sweet-potato-spicy-turkey-sausage-soup-with-kale/. While the meat cooks, make your sauce. In a saucepan, add another Tbsp or so of oil and heat over medium-high heat. Add the rest of the diced onion and cook for a few minutes until soft. Add the rest of the minced garlic and a pinch of red pepper flakes, cook for another minute. Add tomatoes, bring to a boil, season with salt and pepper to taste, then reduce heat, cover and simmer 10 minutes, stirring occasionally. Off heat, add parsley and use an immersion blender to puree the sauce slightly. Meanwhile, add kale to a food processor and pulse until finely chopped. Add ricotta, 2 Tbsp grated parmesan, salt and pepper to taste. Process until smooth. Once the turkey is cooked through, remove from heat and mix in the kale-ricotta puree. Assemble the ravioli by just barely overlapping two strips of squash next to each other lengthwise. Do the same over the middle of the first two strips, but perpendicular, creating a cross or “t” shape. Spoon the turkey/kale filling in the center of the cross, then bring all the ends of the squash strips together, overlapping each other, to create a square-looking “ravioli”. Check out the blog linked above for specific how-to pics. Spray a casserole with non-stick spray and put a little of the tomato sauce on the bottom (just enough to coat the bottom). Next, place the ravioli seem-side down. 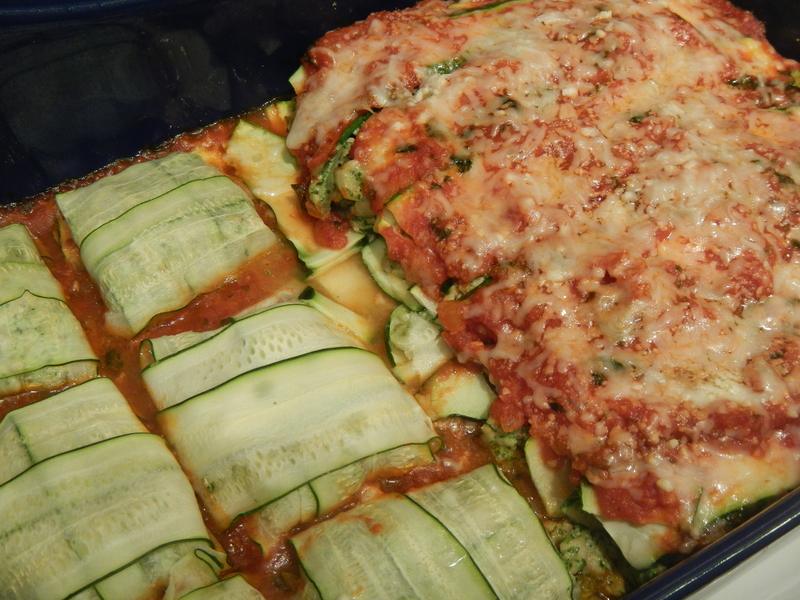 If making the lasagna instead, lay strips of zucchini end to end, across the whole casserole dish, on top of the sauce. Add a layer of the meat mixture, top with another layer of zucchini. Add the remaining meat and top with a final layer of zucchini (from bottom to top it should be zucchini, meat, zucchini, meat, zucchini). Add a layer of sauce on top of the zucchini and finish with a layer of shredded provolone. Regardless if you’re making ravioli or lasagna, cover casserole with foil and bake for 15-25 minutes, or until zuchini is tender and the filling is warmed through. Remove foil and bake uncovered for another 5 minutes. To serve, dish out ravioli or lasagna and top with a little more sauce if desired. Garnish with parmesan cheese and serve with a salad.